If you’ve ever wanted to join our Books and Brews book club on the first Monday of each month, but the time just doesn’t work for you, you can still read the books we’ve read and discussed! Rogers Public Library has created a Book Club Bag Kit for you to host your own book club. In every Book Club Bag Kit, there are 10 copies of a book along with a copy of discussion questions to get the ball rolling. We also include a themed recipe and sometimes supplemental material to help with discussion such as author interviews or additional background information. You’re able to check out the Book Club Bag Kit for 6 weeks, which should be plenty of time for your group to read the book and discuss it! 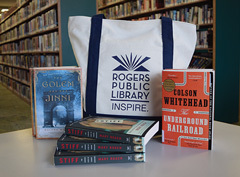 You must have a Rogers Public Library card for at least six months and be over the age of 18 to check out the Book Club Bag Kits.